Connecticut’s largest and most diverse deepwater port complex, the Port of New Haven, moved more than 10 million tons in 2016, ranking the port 53rd in the U.S. in terms of cargo volume. Considered the busiest port between New York and Boston, the port of New Haven is a crucial part of Connecticut’s maritime economy. 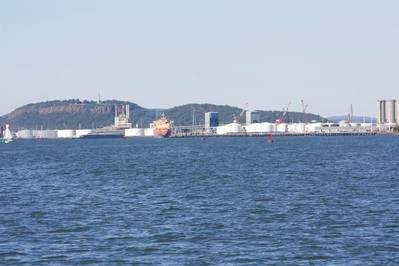 With seven privately-owned and operated terminals, New Haven is the gateway to New England and the primary point of entry for much of Connecticut’s heating oil and petroleum products. New Haven is already the deepest of Connecticut’s three deepwater ports, accommodating ships with up to 40,000 tons of deadweight cargo. Thanks to an ongoing, three year study by the Army Corps of Engineers, New Haven’s channel may be getting even deeper. The Army Corps is currently exploring the benefits of the expanding the channel to between 37 and 42 feet in depth. “Deepening the channel will make our port safer and more accessible to countless shippers,” said Judi Sheiffele, executive Ddrector of the New Haven Port Authority. New Haven already boasts strategic connections to rail, interstates and pipelines. The Buckeye Pipeline provides direct access to Bradley International Airport and the Massachusetts Air National Guard, while easy access to Interstates 95 and 91 and rail service via Genessee and Wyoming make New Haven a gateway to the Northeast, Canada, Mid-Atlantic and beyond. New Haven’s seven privately-owned terminals offer state-of-the-art facilities and expert handling of liquid and dry bulk, breakbulk, and project cargo. Shell, Magellan, Gulf and New Haven Terminals all specialize in petroleum and liquid cargo. All have access to a network of specialty pipelines, and Magellan and New Haven also operate their own off-site storage facility. Gateway Terminal, meanwhile, is helping to keep the environment cleaner by taking over 700 trucks off the road per year thanks to their handling of a special chemical salt used in water treatment. This salt is processed in a nearby facility, but used to be trucked to Long Island for storage. Now it is stored locally at the Port of New Haven—a much more efficient and cost-effective process. Gateway also handles dry bulk, including cement and exports scrap metal. American Green Fuels operates a new, modern facility to manufacture and ship biodiesel. Harbor Terminal, on the other hand, specializes in steel and breakbulk—especially steel coil and rebar. Rounding out the terminals is Clean Harbors, located north of the Q Bridge. Clean Harbors collects “dirty” or contaminated products and transports them to their filtering facility, then ships the newly cleaned materials by barge. It is one more way Connecticut enterprises are reducing waste and promoting reuse. This week, the U.S. Army Corps of Engineers released its analysis that dredge materials from the port of New Haven would be safe for open water disposal—opening up new, beneficial reuse options and making the project much more cost-effective. Open-water disposal of dredge materials would shorten the haul distances and provide an opportunity to create new shellfish habitats, restore our salt marshes, and resolve the pit issue at Morris Cove. “This means we have the opportunity to not only expand commerce through the port of New Haven and create jobs, but we can also have a positive impact on the surrounding environment,” said Scott Bates, Chairman of the Connecticut Port Authority. “The New Haven project is a major investment in economic growth and job creation across Connecticut. The Connecticut Port Authority is proud to be a part of it, and we look forward to moving ahead with our partners at the U.S. Army Corps and the New Haven Port Authority.